Question-1 :- How would you rewrite Euclid’s fifth postulate so that it would be easier to understand? Two lines are said to be parallel if they are equidistant from one other and they do not have any point of intersection. In order to understand it easily, let us take any line l and a point P not on l.
Then, by Playfair’s axiom (equivalent to the fifth postulate), there is a unique line m through P which is parallel to l.
The distance of a point from a line is the length of the perpendicular from the point to the line. Let AB be the distance of any point on m from l and CD be the distance of any point on l from m.
It can be observed that AB = CD. In this way, the distance will be the same for any point on m from l and any point on l from m.
Therefore, these two lines are everywhere equidistant from one another. 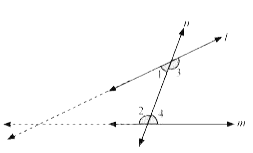 Question-2 :- Does Euclid’s fifth postulate imply the existence of parallel lines? Explain. producing line l and m further will  meet in the side of ∠1 and ∠2 which is less than 180 degree. ∠4. This means that the lines l and m will never intersect each other. Therefore, it can  be said that the lines are parallel.